Notably well sung and rattling along at speed, EUSOG’s production of Chess, at the Pleasance all week, lacks assurance at times but is largely successful. A success in its original West End incarnation, the musical has not had as distinguished a time since then as its pedigree – lyrics by Tim Rice, music by ABBA’s Benny Andersson and Bjorn Ulvaeus – might suggest. In truth, it cannot be counted as any of their finest hours. The story features two chess champions – one American, one Soviet – and their rivalries and romantic entanglements, all played out against the background of the Cold War. The main problem with the musical is that the plot is inadequate for its length, with the motivations of the characters practically non-existent. As a result, it can easily degenerate into shouting of undistinguished lyrics over unmemorable tunes. Director Ethan Baird manages to avoid most of this by keeping the pace high throughout. Not everything succeeds, but the overall effect is slick and polished. The problem of a chess match being a less than riveting visual spectacle is partly solved by having the actual matches played high up at the back of the stage where the audience cannot see what is going on, while the chorus dance around in front. However, this does not really come off; the chorus numbers throughout the show seem hampered by the stage appearing too crowded, and the routines are not as snappy as they might be. Similarly, the use of video screens is not entirely successful – the use of a camera to relay onstage action seems unnecessary, especially when the resultant picture is less than sharp. The pre-recorded inserts, meanwhile, are hampered by poor sound, unsteady accents and uncertain cues. What cannot be criticised is the quality of most of the singing. Lydia Carrington as Florence, who is involved at different times with both the American and Soviet Grand Masters, has a strong and melodic voice. 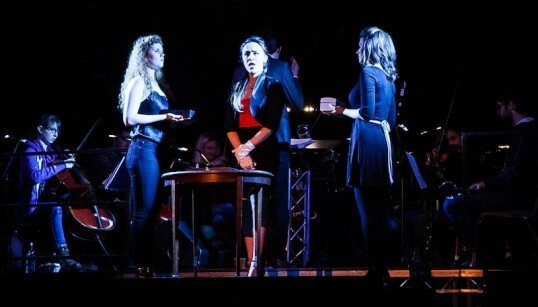 Her duet with Caroline Hickling (the Russian player’s wife Svetlana) on I Know Him So Well is undoubtedly the musical highlight – unsurprisingly, as it is the show’s one truly memorable song. Carrington also has a couple of touching duets with Douglas Clark, who plays Anatoly, the Russian chess champion. Clark has an impressively smooth voice, but does not always yet seem to fully inhabit the role, appearing less than wholly comfortable on stage when he is not actually singing. Tadgh Cullen, who plays the American enfant terrible Freddie, is obviously an exceptionally talented singer, but displays a tendency to push too hard and overdramatise when his more relaxed moments are far more impressive. The two representatives of the respective intelligence agencies – Molokov (Steven Segaud) and Walter (Peter Green) are both performed with presence and panache. However, the way that the Soviet apparatchik is played for laughs, while his American counterpart is far more underplayed and weasely, has an oddly unbalancing effect. The casting of the chess referee the Arbiter as female gives the steely Giselle Yonace a chance to shine, while having the unfortunate consequence of bringing the inadequacy of the show’s two female roles into even sharper relief – all they do is mooch around fatalistically after men, with Svetlana’s underdeveloped part barely qualifying as a character at all. The largely sung-through nature of the show puts great demands on the musicians, and musical director Jay Cameron deserves praise for marshalling the huge onstage band through proceedings with unflagging gusto. This reflects the amount of preparation that has gone into the whole production. While the second act in particular gets messy and histrionic at times, many of the individual performances are distinguished, and the overall effect is positive. Front: Francesca Knope, Nat Cutter, Ari L’Heveder, Dominic James Lewis, Rachel Cram, Sean Marinelli, Charlotte Underwood Weber, Harry Macgregor and Ruth Eliza Brown.